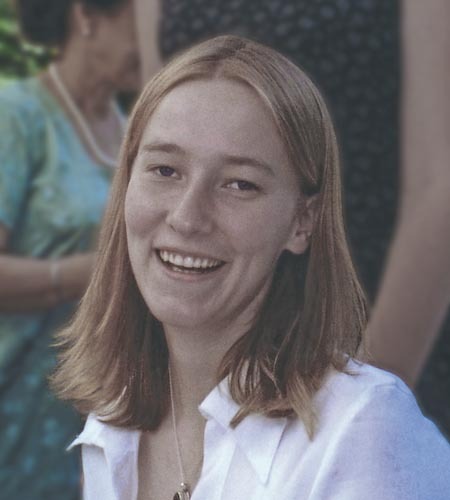 I find myself making more lists, partly because of Rachel Corrie, her penchant to do the same. 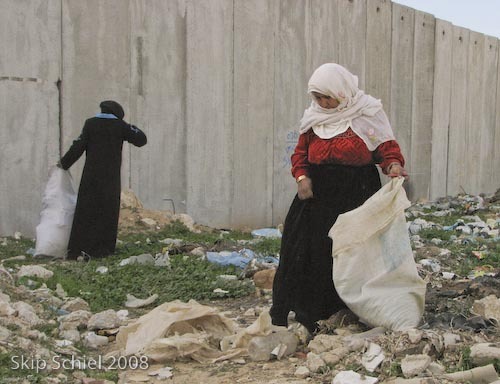 With about 8 others from Friends Meeting at Cambridge, half youth, I saw the play, “My Name is Rachel Corrie,” yesterday [March 22, 2008] at the New Repertory in Watertown Massachusetts. Splendid as expected. One of the most wrenching parts was her writing her friend Chris after she or he had written her, Rachel saying, “Come, Chris, come here, join me!” This resonates with my wish to be there, and my frequently expressed desire for others to join me. The killing was off stage, delivered by a first person observer (not Joe Carr who also was there, who made many of the more famous photos of her killing), in a matter of fact voice, after she’d said she was going to join some Palestinians for food (or something similar, equally inane). The play ended with the tape of her at age 11 giving a speech about ending global suffering. Stacy Fischer, playing Rachel, embodied her perfectly, leading to 2 consequences for me, related: Rachel lives, as resurrected, good timing since Christ springs back to life today on Easter, and I fell in love thru Rachel with Stacy—or thru Stacy with Rachel. I felt throughout the play that I was watching not the actor, but a reincarnated form of Rachel. I could alternate viewpoints—now Rachel, now Stacy—and the 2 flowed gracefully into each other. As if Rachel, dying, knew Stacy would bring her back. As if Stacy, preparing to be an actor, knew she would someday be tasked with enlivening Rachel. During the Q&A with Stacy and the New Rep headman, Rick Lombardo, I asked about a scene near the end, while she was in Gaza, recounting an earlier episode when she worked or volunteered with a drop-in center and brought clients to the local Dairy Queen. “What was this all about?” I inquired. Stacy answered, looking directly at me, “We’re not sure, maybe to lighten the death presence in the last part of the play,” and then she seemed to glance at me from time to time during the rest of the discussion. As if she knew me from some other ethereal region. I asked also about the absence of any reference to the tunnels, part of the justification Israel uses to explain demolishing homes in the Philadelphia corridor. Rick answered that there are many viewpoints about Rachel’s act and the context; we only presented from her point of view. This article by was originally published in The Observer newspaper on the 2nd March 2008. “After Rachel was killed.” When I meet the Corries, it swiftly becomes clear that there is a great deal they want to speak out about, but it is these four words, heavy with loss, that they have repeated most over the past five years. And you can imagine, we were so excited about this [proposed opening in NYC in 2006, later cancelled], and we realized that we didn’t need to be playwrights. We just needed to edit Rachel’s words, that Rachel could tell her story all on her own. And so then, the patchwork was just moving around Rachel’s words, timings. And, in fact, the first third of the play is before she even goes to Gaza, and it’s her packing in her bedroom, finding old journals, telling stories about bumping into ex-boyfriends or her job or female friends or just being an ordinary teenager, before she made the big decision to go to Gaza. In a quiet moment, I look at this site, these photos, and remember, and breathe deeply to check in on my feelings. I am glad, you (Skip) keep uttering, keep the truth and images of the truth flowing. At 11 p.m., led from your excellent story to the 3/22/06 broadcast of Amy’s DemocracyNOW! broadcast, I am educated, yet again, by you and by Amy. I didn’t discover DN’s dynamics until after coming here; all other evening newscasts fell away. I knew of Rachel’s story as an international news event long before that discovery, but no more. This evening the mind that read you’d seen the play in Watertown was oh so parochial, not at all the same as it is now, after seeing Amy’s broadcast, and thinking back on that Watertown event. The stretch from a US town to worldwide, complicated art news in only a little over one hour is quite something for an old lady. I’m grateful to you, wonder when I can see the play, read the book – in other words, move along – I certainly will! – on another path you’ve opened. Thank you, Skip. I’m glad that you are still remember that cute girl, last Friday I met some of this youth from Rachel Corrie Peace Center, on a party for the children in Rafah organized by popular achievement program with AlAsria & Rachel Corrie Peace Center, and I remember that baby when you try to have photo to hear, & she start to cry, any way thanks for caring. i’m glad you still remember me. i feel so far removed from gaza, yet struggle to stay in touch. thanks to the magic of the internet and the absence of censorship (so far) we can maintain our many connections. you seem to be getting younger as you age. i should consider moving into your facility. i’m impressed with your willingness to stretch. as oliver wendell holmes said, once a mind is stretched by a new idea it never returns to its original dimensions. I will have Rachel in my heart always! I can tell that this is not the first time at all that you mention the topic. Why have you decided to touch it again? 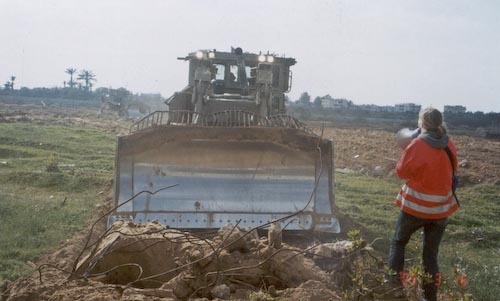 i refer to rachel corrie regularly in some of my slide shows, notably, eyewitness gaza. i’ve dedicated that show to her and another courageous activist, hilda silverman. A great human, she was. An activist…..well, I guess that’s what happens when you don’t mind your own business and try to block a bulldozer with your body. Standing in front of armoured D9 dozer? In a war zone thats not your war, not your country? That redefines stupidity. Maybe it was just a death wish. Reminds me of “suicide by cop”. It’s not a stupidity. It’s a humanity. She is really a good girl since she was a little kid. That’s why she could stand up for other people even she didn’t know them at all, even it’s a war zone that’s not her war, not her country. What, no photos of her burning a mock American flag to the delight of onlooking Palestinian children and adults?? That same American flag that they later wrapped her halfwit corpse in. I’ll be thinking of Rachel the next time I sit down for a bowl of squash soup. Pancakes already make me think of her. To Jeff Idiot,Joe Kafir, & StinxRay: you zionazis epitomize what is wrong with the world: you call this girl stupid because she stood up for what is right and just, but you praise the racist genocidal settler-state that now occupies Palestine, a state populated by European (NON-SEMITIC) descendants of converts to Judaism…on a stolen Arab land, maintained by over $2 Billion dollars of “aid”, in cash and weaponry, from the US tax-payers, EVERY YEAR since the late 50’s! Your ilk sent thousands of Americans to die in Iraq, and to kill thousands of people defending their land, all on a LIE manufactured by Bush the coup-maker, to benefit the Zionist entity in Palestine! The attached link to the Israeli paper “Haaretz” will enlighten any reader who wants to know the truth about “Israel”: http://www.haaretz.com/print-edition/news/odigo-says-workers-were-warned-of-attack-1.70579. Then tell me that Rachel was stupid; it is the Americans who support Israel instead of their OWN country who are stupid, the Americans who listen to politicians promising to support “Israel” instead of America’s interests. If Rachel were stupid (and she wasn’t), then you must be traitors! I believe it was Yehuda Menuhim (or his son Moshe) who stated that “Zionism is nazism translated into Hebrew”. “Jeff Idiot, Joe Kafir, and StinxRay”, you are prime examples of this concept and sick mentality. 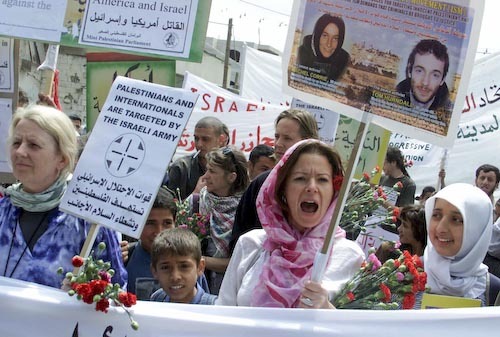 In fact, she was a martyr, and Arabs will never forget her ultimate sacrifice for Justice. 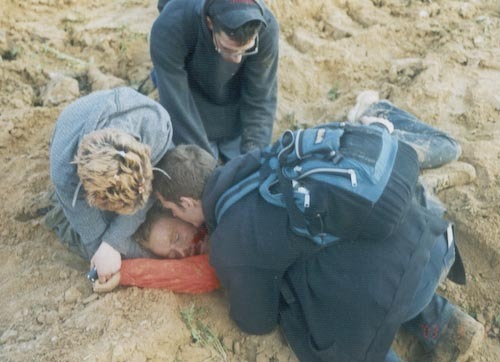 It may be significant that on the one hand we have Rachel Corrie, who stood up for something she believed in, and placed her own body between the victims and the perpetrators of injustice. On the other hand we have people who mock her for not having the sense to get out of the way of a bulldozer. Very witty people, nyuck, nyuck, nyuck. These witty souls seem to have problems understanding the historical efficacy of non-violent resistance. They would have probably thought that Jesus of Nazareth was a REAL dope. He had the family connections and the smarts to make a real success for himself as a priest. With his gift for gab, and his ability to do part tricks (water into wind, loaves and fishes, etc) he could have become a real Mensch. Instead, he makes with schlepping around with a bunch of lowbrow fishermen, ticking off the priests, and then when the Romans come for him, does he run? No. Does he fight? No. Does he plead for his life? No. He endures the thorns and lashes, and then like a complete putz, when they’re pounding nails through his flesh he asks his father to forgive them. What a disgrace. Not loyal to his leaders, lacking the initiative to prosper, the courage to fight. you speak my heart. thank you so much for your wit and humanity. it effectively counteracts some of the other comments to this post. This is the Virgin Birth, an article of faith among Muslims. Maybe these facts will dispel some of the latent (and overt!) anti-Arab anti-semitism some commentators apparently harbor! …if you want Peace, work for Justice! God Bless Rachel Corrie and her family.